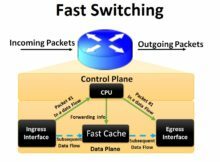 WHAT IS FAST SWITCHING ? Fast switching was the initial Route caching service enabled on networking devices and was endorsed well by industry leaders due to its functionality of offloading the Route processor. Fast Switching is actually a reactive cache-based IP forwarding mechanism i.e. the address lookup uses a route cache to find the IP next hop, outgoing interface, and outbound layer-2 header. Destination addresses are stored in the high-speed cache (Fast Switching) to expedite forwarding. Routers offer better packet-transfer performance when Fast Switching is enabled. When using Fast Switching, the first packet for a specific destination is forwarded to the route processor for a switching decision. When the processor completes its processing, it adds a forwarding entry for the destination to the fast cache. When the next packet for that specific destination enters device, the packet is forwarded using the information available in the fast cache without directly going to processor for routing decision. Let’s note that fast switching allows outgoing packets to be load balanced on a per-destination basis unlike [p2p type=”slug” value=”cisco-express-forwarding-cef”]CEF[/p2p] which has both options of per-destination and per-packet load balancing. As shown above, “enabled” confirms that Fast Switching is configured on the interface. Below command “show ip cache” shows entries for Fast Switching. As seen from the output, this cache is empty since no traffic has traversed till now.